This February, following nine months of discussion between General Motors and China’s Sichuan Tengzhong Heavy Industrial Machinery Company, negotiations to sell the Hummer brand collapsed. Even though other potential suitors were rumored, GM has halted its H3 assembly line in Louisiana and begun winding down Hummer retail operations. Desert Storm’s poster child and the vehicle that Arnold Schwarzenegger personally help turn into every sportsman’s dream machine has expired. The 100+year Hummer scrapbook follows. 1907 Car dealer John Willys took over the financially troubled Overland car company and established Willys-Overland in Toledo, Ohio. 1941 Willys began manufacturing MA and MB 1/4-ton trucks for the US Army. An estimated 363,000 Jeeps were produced by Willys during World War II. 1945 Shortly after peace returned, Willys began selling CJ (Civilian Jeep) models. 1953 Following Henry Kaiser’s purchase of Willys-Overland, the company’s name was changed to Kaiser-Jeep. 1970 American Motors purchased Kaiser-Jeep which by now was producing Jeeps, pickups, Wagoneers, and military trucks. 1971 A new subsidiary called AM General was formed to manufacture commercial vehicles for American Motors. 1981 Development commenced on a High Mobility Multipurpose Wheeled Vehicle (HMMWV) to replace the Jeep and three other military vehicles. 1983 AM General was purchased from AMC by LTV Aerospace and Defense. 1990 The Persian Gulf War, also known as Desert Storm, began. The M998 HMMWV – nicknamed Humvee and later Hummer by GIs – produced under contract by AM General in Mishawaka, Indiana, played a crucial role in the ground campaign. While filming the movie Kindergarten Cop in Oregon, actor Arnold Schwarzenegger spotted a convoy of 50 Humvees; he later acknowledged that this event moved him to buy a civilian version if one ever became available. 1992 AM General began selling the first civilianized M998s under the brand name Hummer. 1998 AM General continued production in Mishawaka after responsibility for the Hummer band was taken over by General Motors. The first model – renamed H1 and later H1 Alpha by GM – remained on sale through the 2006 model year. Total worldwide volume was 9350 units. 2003 Collaboration between GM and AM General yielded the more roadworthy HUMMER H2. A modified Chevy Tahoe chassis and a GM 6.0-liter V-8 were the key components; final assembly was still handled by AM General. DaimlerChrysler challenged GM’s use of a 7-slot grille on Hummer vehicles, claiming this was an infringement of patented Jeep designs. A federal district court judge ruled in GM’s favor. 2004 Avtotor began assembling Hummer H2s in Kaliningrad, Russia, for sale through a handful of local dealers. 2005 After Iraqi ground troops were routed, it became clear that HWWMVs were ill suited for guerilla warfare. With nearly two-thirds of the US casualties attributed to improvised explosive devices (IEDs), there was a clear need for additional armor. GIs added their own steel plating in the field and contractors began developing a category of fortified Jeep-type vehicles called MRAPs (Mine Resistant, Ambush Protected). Research and development also began on a new Jeep that will eventually replace the long-serving HWWMV. 2006 A new smaller, lighter, and cheaper HUMMER H3 looked the part even though it was built on the Chevy Colorado’s chassis. GM manufactured this model alongside compact pickups at Shreveport, Louisiana. Export of Hummers to 33 foreign countries commenced. Manufacturing of both left- and right-hand drive models began in South Africa. 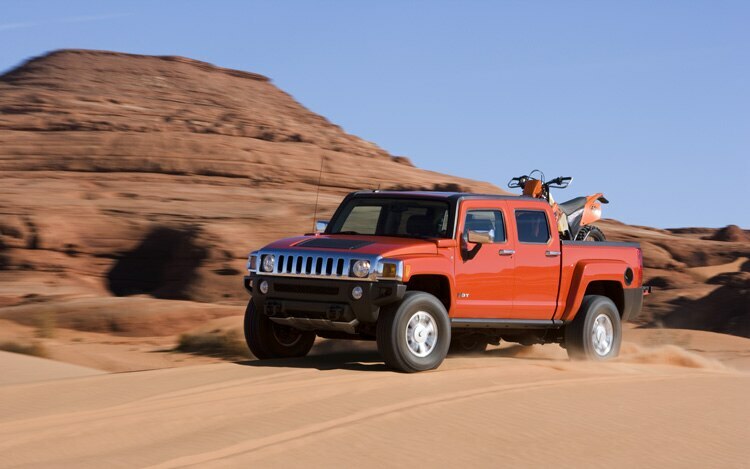 2008 Following a sharp spike in US gasoline prices, GM CEO Rick Wagoner announced that the Hummer brand was under review and that its products might be redesigned or the entire franchise could be terminated or sold. 2009 While preparing for bankruptcy, GM announced the discontinuation of several brands including Hummer. Actually, talks were already underway with the Chinese firm Sichuan Tengzhong Heavy Industrial Machinery (Tengzhong) to purchase Hummer. Later, a price of $150-million and a deadline of March 1, 2010, were announced. Tengzhong manufactures machinery used in road construction, oil prospecting, and chemical plants. GM’s goal was to continue producing Hummers in Indiana and Louisiana until June 2011 with an option to extend that arrangement into 2012. There was hope of maintaining 3000 US jobs and the existing US dealer network. Manufacturing would have eventually moved to China to serve global markets, including the US. February 24, 2010 The sale agreement between GM and Tengzhong was subject to the approval of the Chinese government. Two awkward issues cropped up. One was Hummer’s status as the gas guzzlers’ poster child. China’s reputation as the world’s leading polluter and natural resource consumer would be further discredited by endorsing Hummer. But the real show stopper was the financing Tengzhong needed to create new products and modern facilities. Chinese banks failed to rise to that cause. And the government ruled against foreign investment funds because they didn’t want outside interests building trucks in China. April 2010 GM offered rebates as high as $6000 to help sell their remaining Hummers and instructed dealers to wind down their franchises. Ultimately, Hummer failed because it wasn’t an attractive investment opportunity for any bank large enough to afford it. The final count shows more than 355,000 Hummers built and sold for civilian use. The HMMWV’s long road from battlefield to boulevard to oblivion. The sale of General Motors’ Hummer brand to Sichuan Tengzhong Heavy Industrial Machinery Corp.